I have a new polish from Girly Bits to share with you today. This polish is part of her newly launched Colour of the Month series. This month there are two polishes, Sun Dog and Dancing in the Moonlight. I have Sun Dog to show you today. There are two opportunities to purchase this polish. Today is the last day for the first opportunity to purchase. The second opportunity to purchase will be on the 24th and it will remain available until the last day of the month unless it is sold out prior. 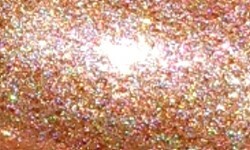 Sun Dog is a is a light golden copper shimmer holo (shimmolo), with bronze micro flakes and copper shimmer. Color: This is gorgeous summer golden holo with some fun bronze and copper sparkly bits. I love holos that have some other added effects to them that make them stand out. It's pretty color, but I think it maybe a bit warm for my skin tone. Formula: This had an excellent formula. This was very smooth and easy to apply. I used 2 coats above. Price: This is $12.55 on Girly Bits website. Please note the purchasing opportunities I listed above for more information on how to purchase and when. Overall: I love holo like this that have some added dimension. This golden bronze is a perfect color for summer and definitely ties into the Olympics going on right now. I'm not sure this is the best color for me, but I think outside of that it's nice color with an excellent formula.